My waiting list is large, so at this time I am not adding any more names to it unless you are willing to wait for some time. If so, please email me at [email protected] or [email protected] . We are a small cattery and presently have only two breeding females, so only have three litters per year at the most. I breed sealpoints and bluepoints in all three patterns. 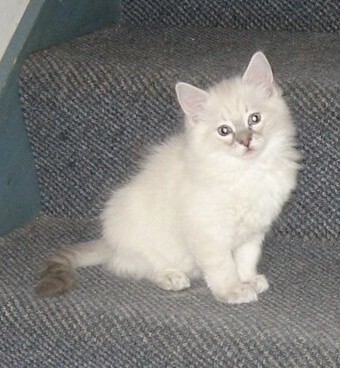 Shakira, who is a chocolate lynxpoint, can make chocolate colored kittens in the mitted and colorpoint pattern. Many of the kittens will be lynxpoints, as their father Cowboy is also a lynxpoint. Cassadee is my younger female, and is a seal mitted girl. 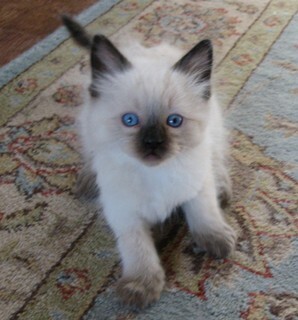 She and Cowboy will make kittens that are sealpoints or bluepoints, in all three Ragdoll patterns. Some of those kittens will have the lynxpoint striping passed down by their sire. We require that buyers of our kittens sign a contract with us. It protects the kitten, us and the buyer. Our contract guarantees that, at the time of purchase, the kitten is free of the various diseases that strike kittens and catteries, and that it is also free of worms and fleas. It guarantees the kitten is free of inherited defects as well, for up to a year. It also stipulates that the cat will not be declawed. Ragdolls are easily trained to scratch on appropriate posts and scratching pads. There is no need to mutilate their feet to prevent damage to your furniture. The buyer also agrees to give the kitten good quality food, to keep the cat inside, and to have regular vet care. We can provide a sample of the contract upon request. Our pet and show/alter kittens are spayed/neutered prior to leaving our home. 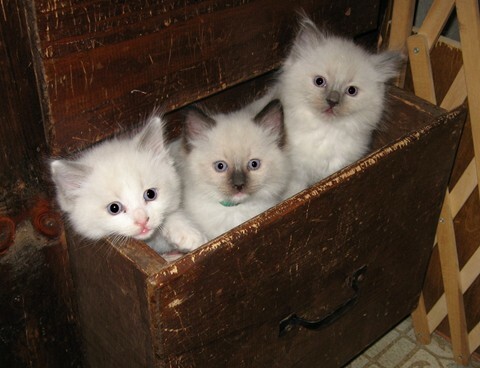 Although the majority of people are trustworthy and have every intention of neutering their new Ragdoll, some individuals have been known to buy a pet Ragdoll and then breed it without papers. Shelters alter kittens before they place them, and we, as breeders, should be as conscientious as shelters. Breeders are sold to registered catteries only, and I must approve of the way they will be housed. 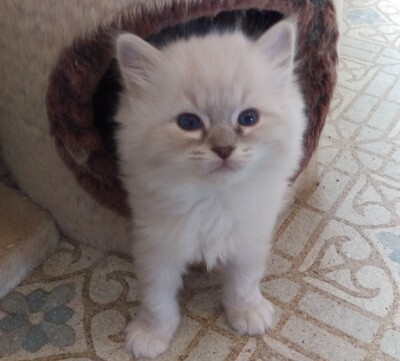 Our breeding cats have all tested negative for the HCM gene in Ragdolls, or their parents are both negative. Results are available upon request. Our kittens are raised here in the house with us and the other cats and are given lots of socialization to get them ready for their new homes. At about six weeks old they can ‘receive visitors’, so you can come and see them. At around twelve weeks old, the kittens are mature enough to be spayed or neutered and go to their new homes as soon as they have recovered from their surgery. By that time they are litter-trained, eating dry and canned cat food and have been introduced to the scratching pads. They also have received their first ‘kitten vaccinations’. We have two large dogs who share the house with the kittens, so they become well socialized to dogs. However, my contract includes instructions on the proper way to introduce a small kitten to new dogs, and buyers with dogs are required to sign that they will follow those instructions.